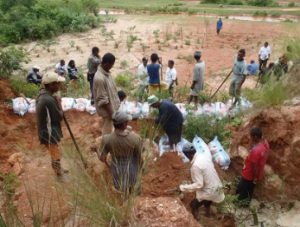 AI-CD Secretariat Support Team / Oriental Consultants Global Co., Ltd.
How Does Land Degradation Abet Poverty in Central Highlands of Madagascar? 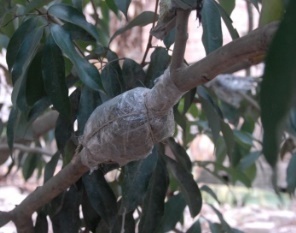 Madagascar has more than 250 thousand species of wild animals and plants, and approximately 80% of them are endemic. But forest trees are disappearing, and can you imagine what would happen to the rich biodiversity of this country if this situation continues? 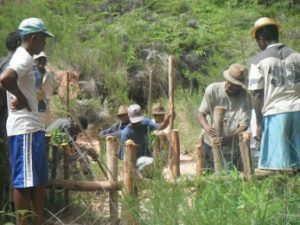 The main cause of deforestation in Madagascar is the increasing pressure on forests as a result of growing demand for land due to the rapid growth of human population, conversion of forest lands into farmlands, slash-and-burn farming, fuelwood collection among others. 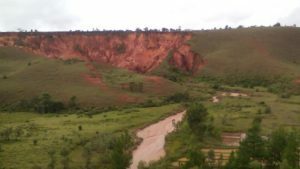 Land degradation caused by the disappearance of forests is, in particular, conspicuous in the upstream central highlands, where bare hills are widespread and spectacular gullies known as “lavaka” (a Malagasy word for “hole”) are familiar sights. In general, population living in upstream areas is poor. 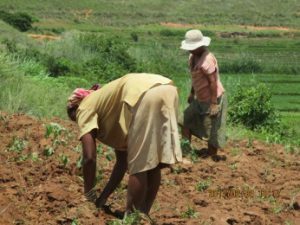 The people are even getting more impoverished with their agricultural practices, especially in rice farming, being impeded by the formation of lavaka. Lavaka formation causes sediment runoff from collapsed hillsides, which flows into farmlands, water sources, irrigation waterways, and roads. Furthermore, a huge amount of the sediment, carried by river and stream flows, spreads over downstream paddy fields. This situation shows how soil conservation and the people’s lives are closely linked. 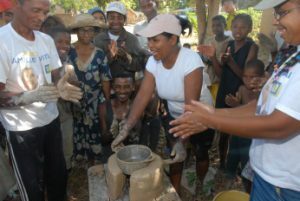 As one of the solutions, the Government of Madagascar and Japan International Cooperation Agency (JICA) implemented PRODAIRE, or Project of Integrated Development Approach in order to Promote Environment Restoration and Rural Development (“PROjet de Développement de l’Approche Intégrée pour promouvoir la Restauration Environnementale et le Développement Rural” in French) from 2012 to 2018, in two regions located in the central highland: Alaotra Mangoro and Bongolava. This project aimed at developing a participatory model to promote soil conservation and livelihood improvement. 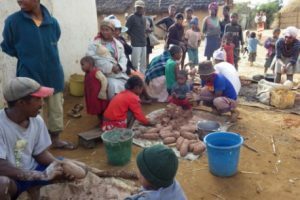 The model developed by PRODAIRE was named LIFE Model, or “Lahasa, Ifandrombonana ho Fampandrosoana ny ambanivohitra sy Entimiaro ny tontoloiainana” in Malagasy (Activities of the whole community for rural development and awareness of environmental protection). The LIFE Model adopts a community-based rural development approach named PRRIE, or Participatory Rural Development and Resource Management by Integrated Training for Equal Opportunity, which was developed by Mr. Naoto Noda from Hitonomori Co., Ltd. and have been applied to two preceding JICA projects in Senegal and Malawi. PRRIE builds the population’s basic capacity by holding a series of trainings as the first step. And seeks for further assistance, as the second step, if people demonstrate positive reactions after participating in trainings. Trainings in the LIFE Model are organized based on the following five simple principles to assure equal opportunity for all while realizing high cost effectiveness. 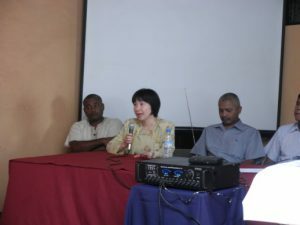 “Most of previous aid projects gave money to villagers to make them plant trees in already demarcated areas,” explains the Chief Advisor of PRODAIRE, Ms. Hiroko Miura from IC Net Ltd. “This method ruins valuable villagers’ initiative and does not contribute to their appropriate comprehension to the problems. Furthermore, training only a few persons on tree planting techniques did not bring about the spread of the technique to a wide area. 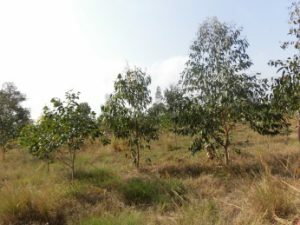 That is why, we decided to disseminate techniques through ‘trainings open to everyone’ so that villagers can continue tree planting and other techniques at the spots where they need to work on,” emphasized the Chief Advisor. “Equal opportunity for all approach” has high similarity with the concept “Leaving No One Behind” pledged in 2030 Agenda for Sustainable Development/SDGs, and can be a key to realize an inclusive society for sustainable development, particularly in rural areas. Who are responsible for organizing trainings and serving as trainers? They could be your neighbours in the village, and not government officers based in the capital city or regional centres far from your homes. 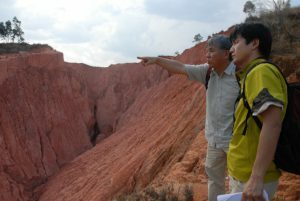 More than 800 local trainers were selected among villagers. Capacity building of local trainers was mainly borne by other villagers who have already obtained technical know-how through, as an example, having participated in other projects. “Unlike previous aid projects, everyone can equally acquire skills and even help people in trouble. We are glad about it,” said a villager delightedly. Another villager, who was landless and socially vulnerable, gained the trust of other villagers by devoting himself to deliver trainings to all his neighbours. Eventually, he was elected by them as member of the village council! Make the best use of local human resources for communication and capacity building—this is how the LIFE model involves all the villagers. Through the efforts of 800 local trainers, more than 8,500 trainings were organized over a period of five years. 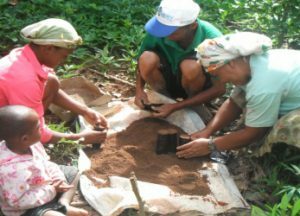 These trainings focused on tree planting on degraded slope, control of lavaka-causing damage, fabrication of energy-saving cooking stove, lychee farming, and aquaculture benefited approximately 143,000 participants, of which 46% were females. 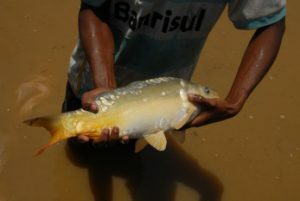 After participating in trainings, villagers have planted 2.38 million trees, treated 100 lavaka, made 21,000 pieces of energy-saving cooking stove, produced 23,000 lychee seedlings, and raised more than 122,000 carp fry. Look at the incredible cost performance. The total cost per tree planted by the households who participated in trainings is approximately USD 0.15 only! This cost includes cost of trainings, including the fee for 800 local trainers, monitoring, and salaries for managers who supervised the local trainers. 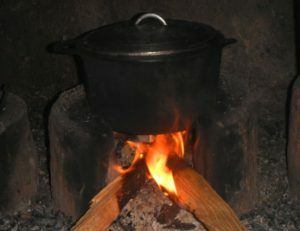 Spread simple techniques that most villagers can employ by making the best use of local human resources and materials, and by holding trainings for all villagers. Then sustain villagers’ practices by providing further assistance if demand arises. 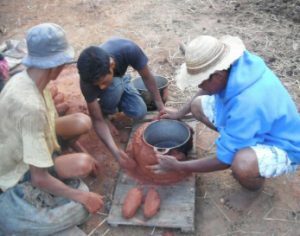 This LIFE model is currently being adopted in various projects in Madagascar implemented by different donors and NGOs. A private company is also adopting this model for its community initiatives. The original manuals are provided in French. The English manuals were created for the sake of convenience by using Google Translate, a third party service which AI-CD secretariat has no control over. AI-CD secretariat does not warrant the accuracy or reliability of any information translated by this system and will not accept liability for loss incurred as a result. If you have any questions about the accuracy of the information contained in the translated manuals, please see the original manuals.